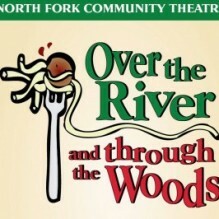 NFCT’s next production is ready to open! Show dates are March 13, 14, 15*,20, 21, 22* 27, 28 and 29*. In addition to the opening night reception sponsored by CAST on Friday, March 13, there will be free Italian themed receptions on Fridays, March 20 and March 27; all receptions are at 7 p.m. Friday and Saturday show time: 8 p.m.; Sunday: 2:30 p.m.
*Matinees at 2:30 p.m. Tickets are $15 and can be purchased at 631-298-NFCT or Click here for tickets online. Synopsis: Nick is a single, Italian-American guy from New Jersey who has received a great career offer on the West Coast. But some of his family is still in Jersey. In fact, he sees both sets of his grandparents every Sunday for dinner, and the news of his impending move doesn’t sit so well with them. Thus begins a series of schemes to keep Nick around. This is a beautiful comedy about family, opportunities and the realities of life. Student Rush: Student tickets may be purchased for $12 at the box office beginning 10 minutes before each performance. These tickets are subject to availability and cannot be reserved ahead of time. Community Action Southold Town will host a free pre-show reception on Friday, March 13, as part of CAST’s 50th Anniversary Celebration. CAST will collect health & beauty aids/personal care items (e.g. toothpaste, toothbrushes, deodorant, shampoo, shaving cream, combs, brushes, moisturizer, BandAids, Tylenol, soap, etc.). Please consider bringing some of these items to the reception for distribution to those in need.